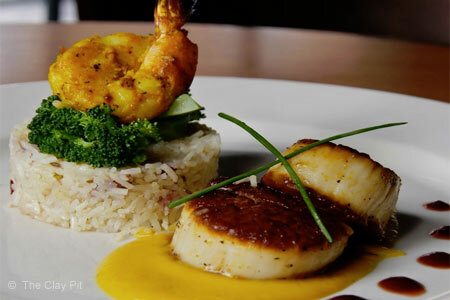 Elegantly presented, regional Indian food in a fine dining setting. : Housed in the softly lit landmark Bertram building with whitewashed limestone walls, The Clay Pit is destination dining for Austinites hungry for subcontinental cuisine. Launch your meal with an order of coriander calamari and palak paneer naan, supple warm flatbread stuffed with sweet spinach purée and tangy cottage cheese. The signature goat saag (halal goat meat with stewed spinach, ginger and garlic) and lamb roganjosh (lamb morsels stewed in Kashmiri style creamy onion sauce) reflect the sophistication of centuries-old Indian cooking. Some like it hot --- and those who do will enjoy the mouth-searing chicken vindaloo served over fragrant basmati rice. Vegetarians have bountiful options a carnivore would do well to order, including aloo ghobi curry and the masala medley, vegetable jalfrezi. A colorful bar scene offers good people-watching, special single-malt scotches and wines by the glass; servers will help you match the right Bordeaux with Indian spices. Delicate desserts like mango ice cream and chai spice crème brûlée are refreshingly light. The big-night-out feel is toned down for likely the best Indian lunch buffet in town.